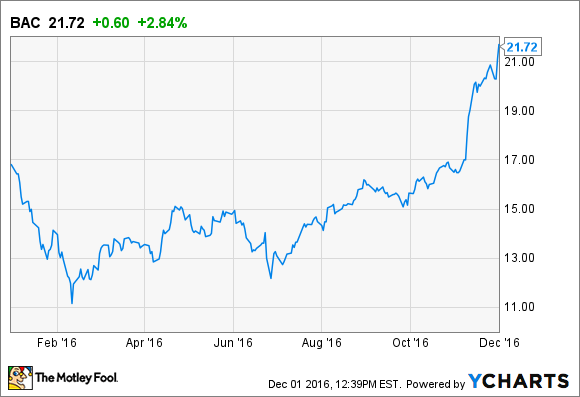 The outcome of the presidential election pushed Bank of America's stock to its highest point in nearly a decade. November was a good month for stocks, but few gained as much as Bank of America (NYSE:BAC). Shares of the nation's second largest bank by assets climbed 28% last month, reaching their highest point since the financial crisis. You can get a sense for Bank of America's performance by comparing it with the KBW Bank Index, which tracks two dozen of the country's biggest banks. The index rose 17.4% in November. That's impressive, but it obviously comes up short of Bank of America. Similarly, while the broader market rallied last month, it too was left in the dust by the North Carolina-based bank. The S&P 500 index finished November 3.4% higher than where it started. Data sources: Yahoo! Finance, YCharts.com. By this point, you probably have a pretty good idea about why bank stocks, and shares of Bank of America in particular, performed so well in November. As you can see in the chart below, Bank of America's stock rose abruptly roughly a week into the month. The timing corresponded to the presidential election. Throughout the campaign, President-elect Donald Trump promised to overhaul the increasingly stringent regulatory regime that has weighed heavily on bank earnings since the financial crisis. By contrast, opponent Hillary Clinton's team offered the prospect of even tighter rules on banks, evidenced by the leading role that Sen. Elizabeth Warren played in Clinton's campaign. Warren has long been a critic of the bank industry, calling for criminal investigations of leading banks and serving as the brains behind the formation of the Consumer Financial Protection Bureau (CFPB), which has targeted banks for a variety of consumer abuses over the past five years. When Trump prevailed, not only did banks dodge a bullet, but they are also likely to benefit from a loosening of the 2010 Dodd-Frank Wall Street and Consumer Protection Act, the legislation underlying the heightened regulatory regime. Throughout the campaign, Trump promised to "dismantle" Dodd-Frank. And that promise was backed up by his choice for Treasury secretary -- former Goldman Sachs banker Steven Mnuchin. "The number one problem with Dodd-Frank is that it's way too complicated and cuts back lending," Mnuchin told CNBC this week. "So we want to strip back parts of Dodd-Frank and that will be the number one priority on the regulatory side." There are a variety of ways in which Bank of America and other banks could benefit from reduced regulation. Easing capital and liquidity rules would free up hundreds of billions of dollars' worth of assets on bank balance sheets that could then be lent out to businesses and consumers. Rolling back the Volcker rule, an element of Dodd-Frank that prevents banks from engaging in certain investment activities, would pave the way for banks to get back into proprietary trading. And putting a tighter leash on the CFPB could spur innovation in the industry by giving banks a freer hand to introduce new products without fear of regulatory backlash as the products are tested and perfected. On top of this, if Trump also follows through on his promise to reduce taxes and invest heavily in infrastructure projects, any resulting lift to the economy could spur inflation. That would incentivize the Federal Reserve to raise interest rates, which would boost the money that banks earn from their loan portfolios. In sum, while Trump certainly has his detractors, there's no question that his victory in the presidential election is good news for bank stocks -- and few have seen more benefit than Bank of America.